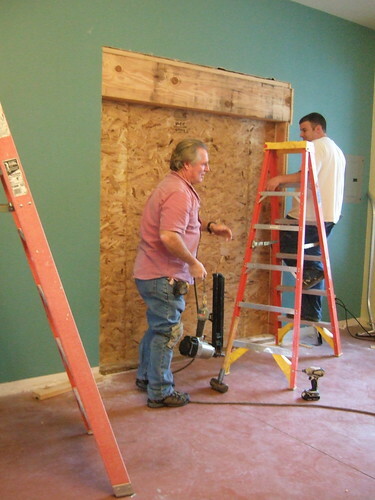 Contractors came in today to break down the wall and put up french doors to connect our two offices. It was really loud and noisy at times and i even saw sparks flying at certain points! The door is up now, just have to get a photo of it once its all finished with framing. They guys are laughing in the photo, saying it better not end up on YouTube. Apparently, they dont know anything about YouTube as this a photo not a video! So no worries guys, you aren’t on YouTube. Just my lonely blog. at your house or at work? sounds exciting, I love home rennovations! I always have extravagant plans in my head…but I guess you need money to actually make the plans happen lol we made new savings accounts to save for diff. things like home rennovations, vacations etc. so maybe we’ll be able to do some more home rennovations soon. At our work place. The door turned out way shorter than “normal” its kinda funny. as far as our house, we dont have any elaborate plans for renovation however do want to get rid of our asbestos at some point…. ugh major project and not too exciting!! !